Remember the days, a decade or more ago, when you feared going to the U.S. because the Canadian peso bought you next to nothing? Well those days could soon be back, according to Goldman Sachs. The investment bank is forecasting that the Canadian dollar will continue its year-long slide for a few more years, hitting 71 cents U.S. in 2017. The bank expects the loonie to fall through the 80-cent mark sometime in the next three months, falling to 76 cents within 12 months, before falling to 71 cents over the following year, the Globe and Mail reports. The loonie fell 3.5 per cent last week, to its lowest level in six years, continuing a two-year-long slide that has seen the Canadian dollar fall from parity with the U.S. greenback to around the 80-cent mark on Monday. 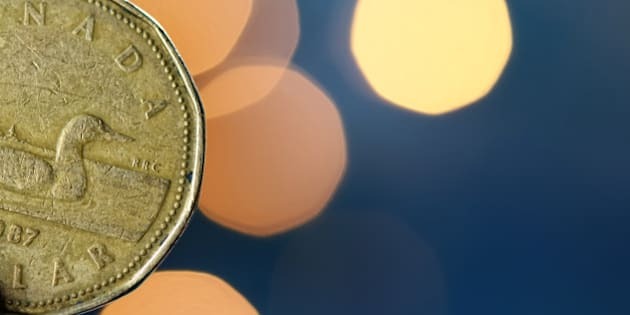 Recent surveys suggest that prices are more or less equal on both sides of the border when the Canadian dollar trades at around 84 or 85 cents U.S. A 71-cent dollar would mean Canadians facing higher prices south of the border than at home. But the upshot could be for Canadian tourism and Canadian retailers, who could see more business from Americans armed with a stronger currency. TORONTO - The Canadian dollar was little changed late morning Monday as traders looked ahead to the latest economic growth numbers and the interest rate announcement by the U.S. Federal Reserve. The loonie dipped 0.01 of a cent to 80.48 cents US. The currency tumbled 3.5 per cent last week to its weakest level in six years after the Bank of Canada surprised markets last week with a quarter-point cut in its key overnight rate to 0.75 per cent. The U.S. Federal Reserve is holding its interest rate meeting on Wednesday. The Fed has been widely expected to start moving rates away from near zero around the middle of this year and traders will be looking for any sign that the central bank could move earlier. Other major data points this week include the latest economic growth figures for Canada and the U.S.
Economists expect that Canadian gross domestic product grew a slight 0.1 per cent during November, reflecting disappointing reports for manufacturing and wholesale sales. Oil prices started to collapse at the end of that month and analysts note that future GDP reports will detail how that decline is affecting the economy. Meanwhile, the collapse in oil prices has led TD to downgrade its economic forecast. The bank now expects the Canadian economy to grow by two per cent this year compared with its expectation in December for 2.3 per cent. TD said it also expects the Bank of Canada to cut its overnight rate by another quarter of a percentage point in March. Oil prices have fallen more than 40 per cent since the end of November when Saudi Arabia rejected calls to cut production in order to support prices. Overall, prices are down about 55 per cent from the highs of last summer as the marketplace works through a huge imbalance in supply and demand. On Monday, the March crude oil contract in New York inched up a penny to US$45.84 a barrel. In the U.S., fourth quarter GDP is expected to come in at an annualized rate of 3.1 per cent, down from a five per cent pace in the third quarter. Elsewhere on commodity markets, February gold bullion faded $13.60 to US$1,279 an ounce while the March copper contract added three cents to US$2.53 a pound. Markets also considered the future of the eurozone after Greece's anti-austerity opposition party won a big victory in national elections over the weekend. Syriza party leader Alexis Tsipras has promised to renegotiate Greece's massive bailout agreements, but has vowed not to take any unilateral action against lenders from other eurozone countries.